Thirsty Pilgrim: Copenhagen, Hasselt, Westvleteren and Worcester. Copenhagen, Hasselt, Westvleteren and Worcester. It's 11.11.11. Make a wish. For example: Maybe your wish is to go to Copenhagen next May and sample the rare and unusual, brewed by the rare and unusual. Tickets for the Copenhagen Beer Celebration go on sale today. I've been a bit snarky (me?) in referring to the fest as "Mikkeller and Friends." It started when the announcement said the brewers there would be the "absolute elite of the international beer scene." Depends on your palate, I think, but I like the confidence. I'd be lying if I said I didn't want to be there. Speaking of festivals... The kind Mr. Paul Briggs recently updated his Belgian Beer Festival Calendar. The link is here and over on the left, as usual. Did you know one of the best fests on the calendar is this weekend? Hasselt. Dig it. Would my first one be a Cantillon Mamouche or a De Ranke Hop Harvest? Tough call. We are currently working with the Abbey to determine the way we will distribute the beer. If any retailers are interested in donating your services for the benefit of the Abbey (meaning no profit), please let us know. We may want to take you up on it. Otherwise, once we decide how we will make this available, we will let everybody know. That's from the importer's newsletter. I have zero inside knowledge on this, but if I were, say, a bottle shop that wanted to stock some Westy, I'd be volunteering to donate my services right about now. Finally, the Sheltons will be cooperating with 12 Percent Imports to organize a fest in Worcester, Mass., on June 23 and 24. The two of them represent several of Belgium's best and most interesting small breweries. Closer and cheaper than Copenhagen for many of you. Is it the "absolute elite of the international beer scene"? Again... depends on your palate. Take a Walk with Mr. De Prins. 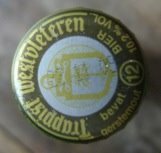 Some Dupont News, and More from Westvleteren. More (Better) Beer Guides Please.